Has art always been a passion of yours? When did you decide to become an artist? As an American recently translocated to the UK what have been the most significant culture shocks? As I landed in rural England, I think the first bit of culture shock was that people hung produce on their gates with a price and a pot for money with no one in attendance. (That would not have gone well in any part of the US where I have lived.) I was taught to call trousers trousers before I arrived to avoid embarrassment, so that was alright. I am from New England originally so perhaps there was not so large a cultural difference. I think English schools tend to better, on the whole, and British humour is, in my opinion, a far superior thing. I must admit, I am still learning English. My wife, Nimue, runs me through the correct pronunciations by having me recite things like, “The aluminium zebra has eaten my vitamins”. I can almost always say “squirrel” now in a way that does not provoke laughter. Also- real castles and gothic ruins. You lived on a narrowboat travelling the waterways of the UK for a few years. How did you find living and working on a boat? The short answer would be- very, very challenging. Electricity was in short supply, as it either had to come from the solar panel, or from running the engine. The internet was even more problematic. The only reliable access we had was through a hotspot created by my phone, and in some locations that was painfully slow. In other locations it did not exist. I decided to hand paint the pages of Hopeless, Maine Vol.2 to save on electricity (I would have coloured the pages on the computer otherwise) but a narrowboat is always in motion. That was a particularly windy stretch of canal so our boat was pretty much always in violent motion. Also when a big plastic boat goes by at speed, it has a dramatic effect on boats moored in the vicinity. Now, imagine painting in watercolour under those conditions. I recall saying “Oh, well that can be a crow..I guess” rather often. Living was also a challenge, but perhaps not for the reasons you might think. It was very cosy. Four of us (including Mr. Cat) lived in a space six feet wide and forty five feet long. It was cosy to say the least. That part didn’t bother me at all, except during long rainy spells. It was the fact that it was nearly impossible to keep the inside of the boat dry, and laundry was a bit of a nightmare. I don’t drive so groceries were sorted by a bicycle and a rucksack. Also, I had no idea how to drive (“pilot” is probably the correct term, but I perversely insist on thinking of it as “driving the boat”) the boat when we moved aboard and had to learn as we went. Having no keel, a narrowboat is pushed around easily by the wind. Compensating for that while you are waiting for a bridge to open is an art form in itself. 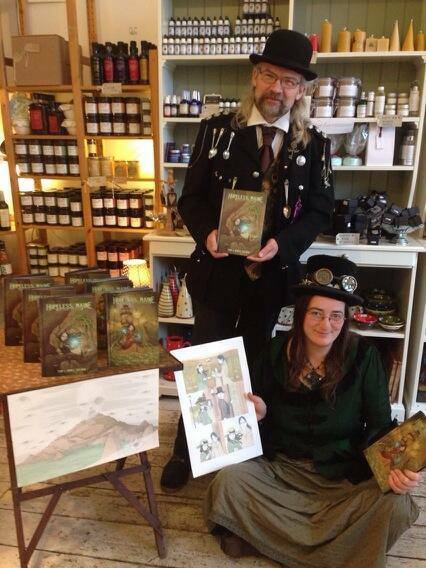 You have created the Hopeless, Maine graphic novel series with your wife, Nimue Brown, which Mark and me both loved. The dark, gothic mood you set in these books provides an enchanting, dream-like background to addressing themes such as friendship, self-worth, loss and growing up. I particularly enjoyed how some of the clues to the story were hidden not in the words, but in the art. Please tell us about the history of these graphic novels – how did the idea gestate? It started out as an idea I had for a comic when I was in my twenties. It was called New England Gothic back then. Owen was named Mordred (yes, I know. I still cringe) and there was no Salamandra. This was self published and ran for two issues before the indy comics boom went bust. 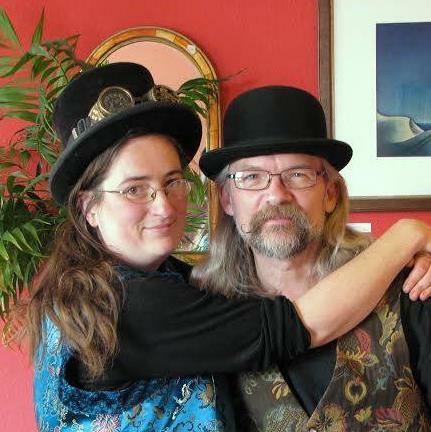 Then many many years later when I was living in a temporary homeless shelter, I began writing the story again from scratch and Salamandra came to me. (So, there you have it. Salamandra was born in a transitional homeless shelter.) When I had a place to live again, I started drawing the story and publishing it on CDs (with music soundtrack from local bands). Then I met Nimue online and fell in love with her writing (first) and eventually convinced her to write the story. It was brought out as a webcomic first, while we hunted for a publisher (as it turns out, having a popular webcomic is helpful in this process). Books one and two were published, but then the publisher was bought by another publisher who was less keen on the title, so we put book three up in webcomic form (Thanks to our friends at Nerbong) and hunted for and found a new publisher. 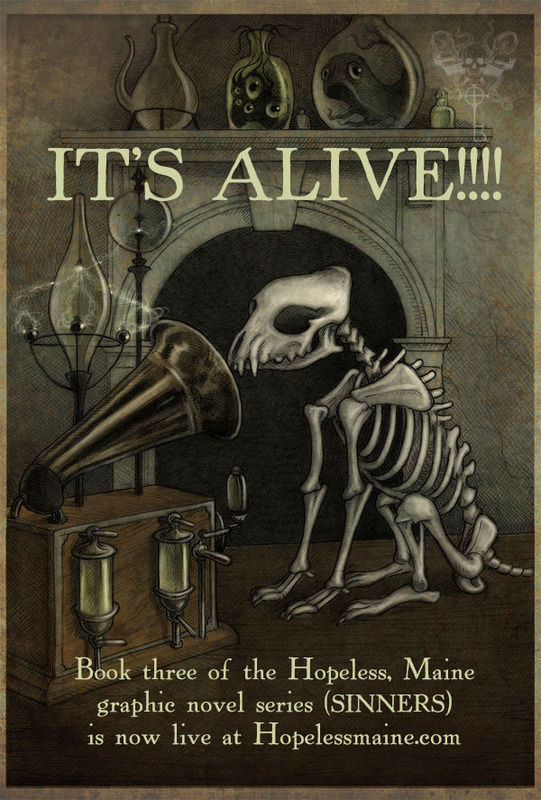 Hopeless, Maine will now be under the Sloth Comics banner. We are massively chuffed. How is the feedback you received for them so far? One of your inspirations I believe is Hayao Miyazaki. What do you like most about his works and do you have any favourites? What other artists influenced you? I like everything about Miyazaki’s work! More specifically though, the way you just have to sort of take it on faith that, in this story, this is just the way things are. No complicated backstory dumps, just take it as you find it. Also there is always a dreamlike quality and sense of the numinous. Nature (by which I mean the bits of nature that are not human or human-made) has a voice frequently also. Edward Gorey was (and remains) an influence. Also Hieronomous Bosch, and Barry Windsor Smith. There are hundreds of others (many of whom I will be very sad that I have forgotten to put in here when I read this). Umm.. well. Window of the soul and all that, I suppose? (Or window into the soulless, in the case of some of the eight eyed ones.) 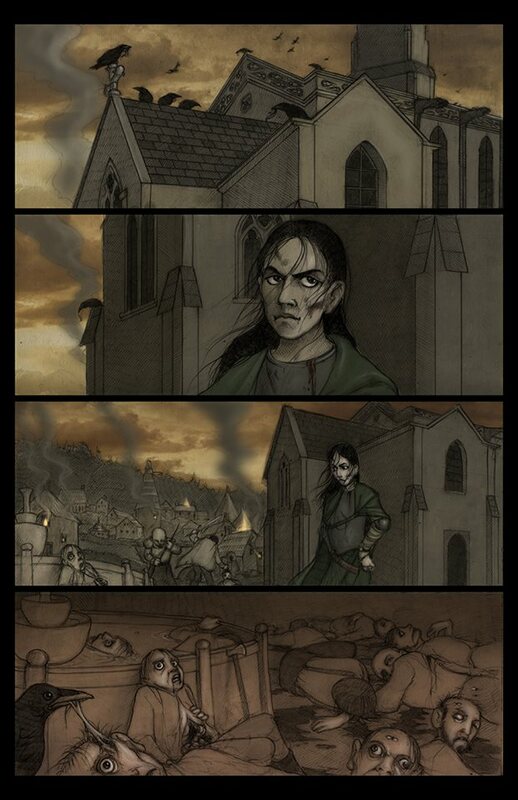 In Hopeless, Maine it is a way of having the setting look back at the viewer in what I fondly hope is a disconcerting sort of way. 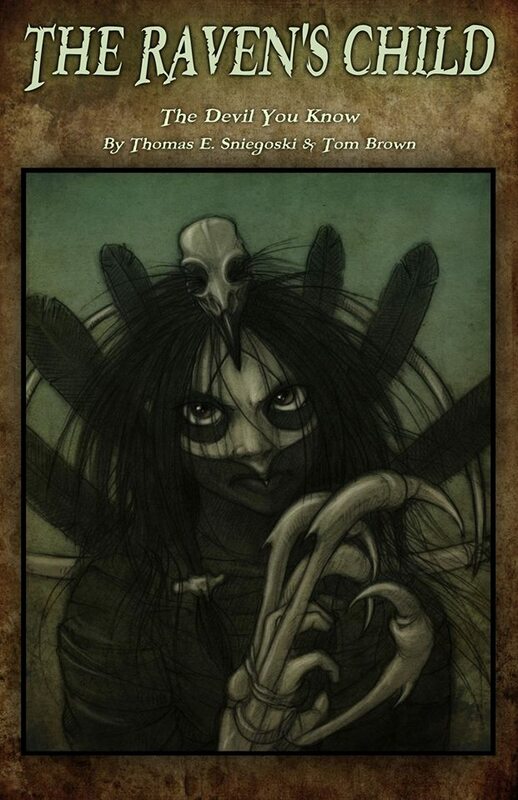 The Raven’s Child you created with Thomas E. Sniegoski has just been published by INKLIT. Could you please tell us more about it? Here is the blurb “When the Throng came, the human race never stood a chance. The monsters were simply too strong, too numerous. It only took a few months for them to take over and leave the few poor souls who survived cowering in terror for years to come. Tom is a consummate storyteller and he pulled out all of the stops on this one. I learned absolute tons from working with him. People are saying that The Raven’s Child is the new Buffy (with some Batman thrown in) I can live with that! I greatly enjoyed doing the creature and setting designs, I think this story played to my strengths there. Everyone should get at least one copy. You have entered and won Mark’s graphic novel contest in 2012. What are your thoughts on Mark’s books and when can we see the rest of the graphic novel? Mark is probably the best writer of epic fantasy in the contemporary market (and better than most historically). I’d love to finish the graphic novel (and can not say more than that). 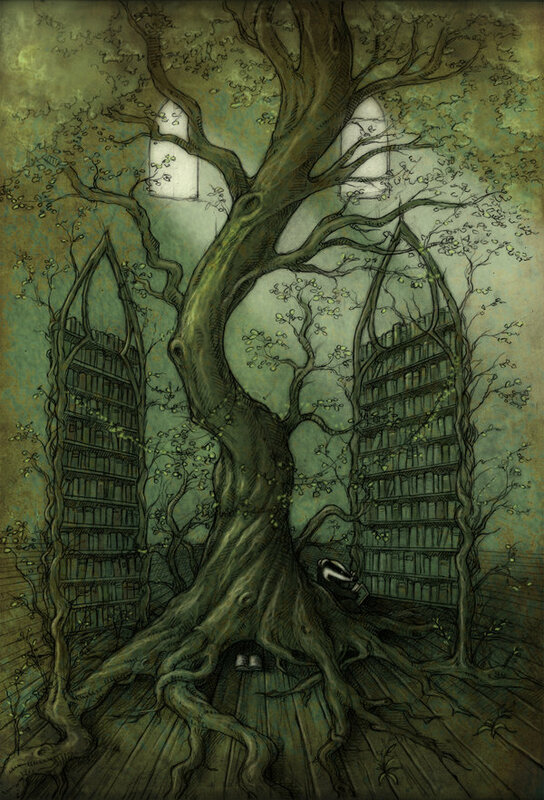 The ‘Neverland’s Library tree‘ is an illustration Tom did for the Neverland’s Library anthology. 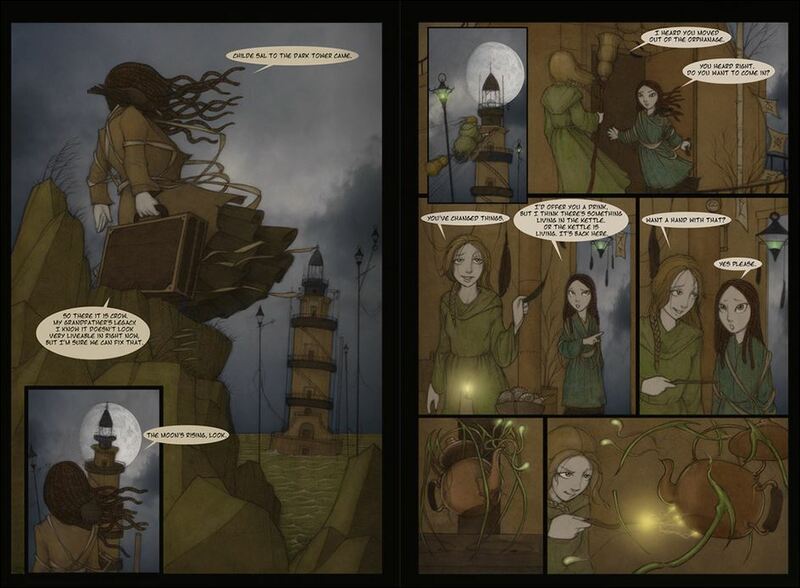 & my reviews of Personal Demons (Hopeless, Maine #1) & Inheritance (Hopeless, Maine #2) over on my blog. Lovely interview with one of my favourite living artist, packed with wonderful art, and info. Plus, I had not heard of “The Wheel Mouse” before – off to check it out. Cheers!